The story behind the scarf is here. 2 colors of Noro Silk Garden, 2 skeins each (4 total). I used Color A: white multi – Color #269. Color B: blue-green multi – Color #264. 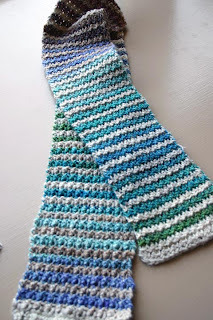 Changing colors: there is no border on this scarf so both edges need to be neat and tidy, not an easy thing when you are changing colors every 2 rows and carrying the yarn not in use up the side edge. The cleanest method I’ve found is to twist the 2 yarns together just before you join your new/carried yarn in the last hdc of each row. 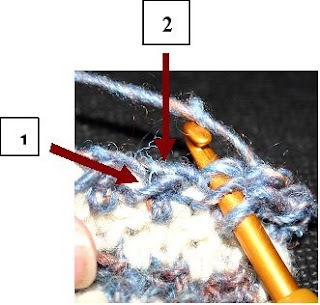 Foundation Single Crochet (Fsc): chain 2, insert hook in first chain of chain 2 (nearest your slip knot), *draw up loop (you'll have 2 loops on hook); draw through first loop (**ch 1 made - still 2 loops on hook); draw through remaining 2 loops. Fsc made. Insert hook in ch 1 of previous stitch, repeat from *. 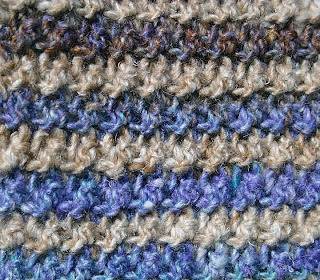 repeat from * across, ending with hdc in beginning ch 2.
repeat from * across, ending with hdc in last slip stitch. 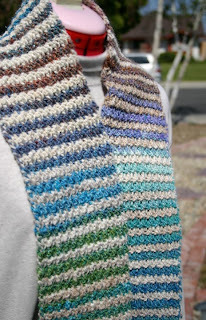 Repeat Rows 4 – 7 until scarf is as long as you want, ending with Row 5 or Row 7. Next Row: Ch 1, turn, sc in each stitch across. Last Row: Ch 1, turn, sc in each stitch across. Fasten off; weave in ends. Wet finish, block lightly and enjoy! Very cool, thanks for the pattern! Beautiful, and even more stunnin in person! Thank you for your class , it was wonderful! I really like your pattern! Very pretty. Oh, that's very pretty. Thanks.